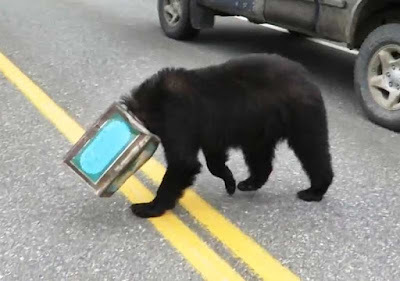 A black bear that wandered onto the Alaska Highway near Tok with a coffee can stuck on its head on Monday morning drew a helpful response from passers-by, with one even attempting to remove the container before state biologists arrived. Randy Rallo, the owner and operator of Tok-based 40-Mile Air, said he was en route to Midway Lake to do maintenance work on one of the company's floatplanes when he encountered a semitrailer stopped, its driver still in the cab, but not pulled to the side of the road, about 15 miles from Tok. "So I pulled up alongside him, and he said there was a black bear walking around with a can stuck on his head," Rallo said. Rallo called local officials with the Alaska Department of Fish and Game. "They said they had already been told," Rallo said. "They wanted to know how big it was, so they knew how much tranquiliser to bring." Fish and Game assistant area biologist Jeff Wells said calls about the bear started coming into his office, as well as to Alaska State Troopers, at about 8:30am. As traffic on the highway was guided past the stopped semi, a state employee tried to get the can off the bear's head. 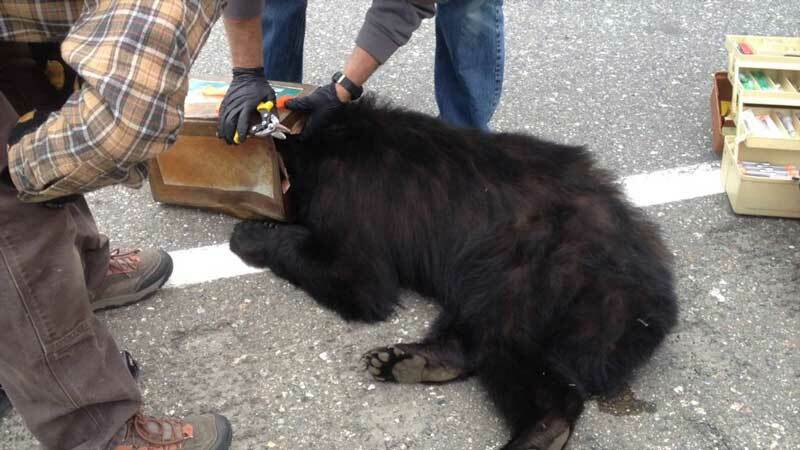 "Some (Department of Transportation and Public Facilities) guy stopped and he tried to take the thing off, and the bear swatted at him and it barely missed him," Rallo said. "He walked off and said, 'Let Fish and Game take care of this.' " Soon afterwards, Rallo continued to Midway Lake to complete his maintenance call. When he headed back, he found the truck still stopped and the bear sitting on the highway beneath the vehicle. "The trucker told me that it had been lying there under his truck the whole time since I had been gone," Rallo said. About 10 minutes later, at about 10:30am, Wells and a Fish and Game wildlife technician arrived at the scene. "It was obviously stressed," Wells said. "At that point it had been wandering around on the road for at least an hour." After shooting the bear with a tranquiliser dart, the Fish and Game staff were able to use tin snips to cut the empty can off the bear, a roughly 3-year-old, 100-pound boar. Wells said the bear wasn't much the worse for wear after the experience. "It seemed in fairly good shape, so it must not have had the can on its head for a really long time," Wells said. The bear also received an ear tag as well as antibiotics and treatment for the dart wound. At that point the Fish and Game crew, along with Rallo, drove the bear a short distance in a pick-up bed, then carried the bear 30 to 40 yards into woods off the highway before the tranquiliser's effects wore off. "They're still awake, they just can't do anything," Rallo said. YouTube link. Alternative YouTube link. "His eyes were open, and he was just watching us." According to Rallo, the rectangular can the bear's head got stuck inside was an antique design, which the bear likely encountered while foraging along the roadside. "There's some old dumps along the highway in that area," Rallo said. "Why he stuck his head in that thing is kind of a mystery, because none of us would have thought there was anything residual in there, anything for him to eat." Although black bears often travel through the Tok area, Wells said, the town hasn't had an incident like Monday's in recent memory. "It's just lucky that it wandered up onto the road where people could see it and we could respond to it in a timely manner," Wells said. Wells emphasised that anyone who encounters a wildlife issue should contact the nearest Fish and Game office rather than deal with it themselves. "The bear may have looked small, but at the end of the day a 100-pound black bear can certainly do some damage," Wells said. "If they had removed the can, the first thing they had seen would have been that person."